One insurance executive risks his fortune to save lives on the high seas because the world’s governments won’t. A single image explains Chris Catrambone’s obsession. It’s a photo of a toddler lying on his stomach as if napping in a crib. Chris Catrambone and his rescue team have pulled more than 27,000 refugees from the Mediterranean, Aegean and Andaman seas. Catrambone has gone from a little-known insurance provider from Louisiana to one of Europe’s most celebrated humanitarians. His crusade began as a pleasure cruise on the Mediterranean in 2012. He is wearing a crimson shirt and navy shorts and kiddie sneakers. The child’s pose is reminiscent of the countless nappy-time photos proud parents post to their social media pages around the world. But three-year-old Alan Kurdi was lying face down on a Turkish beach, his body washed there after his family’s makeshift raft capsized while attempting to reach Greece. Alan, his brother and mother all died—three of the estimated 9,000 refugees who have drowned in the Mediterranean Sea in desperate attempts to escape war in the Middle East and north Africa. The day Alan’s body was discovered, Catrambone and the crew of his Migrant Offshore Aid Station—or MOAS—were rescuing 332 refugees from two listing ships off the coast of Libya more than a thousand miles away. More than 100 of those pulled from the water were children like Alan. And so, even after having pulled more than 27,000 refugees from the waters of the Mediterranean, Aegean and Andaman seas in three years, Catrambone is far from satisfied. 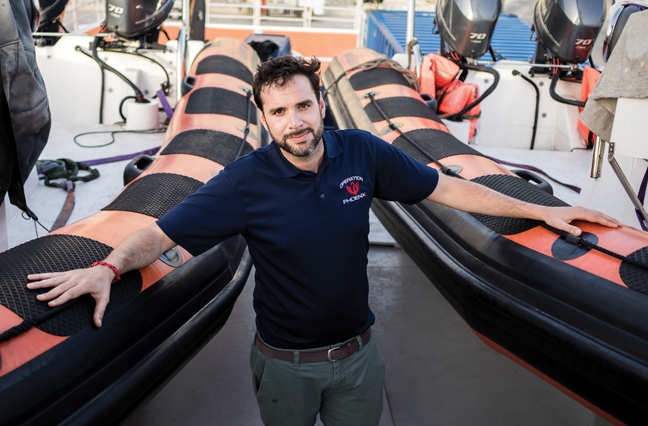 Last winter, his team launched two new boats to assist Syrian refugees crossing from Turkey to Greece. Those craft are named the Galip and the Aylan in honor of the two brothers who drowned in September in the region “to the world’s horror,” he says. And perhaps just as important as their work at sea, Metsola says, is the light MOAS continues to shine on those—mostly Muslims—who have lost everything at the hands of radical Islam. Catrambone’s journey from a middle-class childhood in southern Louisiana to life as a wealthy Maltese-based CEO, adventurer and humanitarian isn’t quite as unlikely as it might at first seem. His father, a liquefied natural gas engineer whose job frequently took him overseas, fueled Catrambone’s wanderlust with exotic stories from oil- and natural-gas-rich countries such as Algeria and the United Arab Emirates. His dad even gave him a shortwave transistor radio so he could listen to English-language broadcasts from his father’s locales. While other teens decorated their rooms with posters of athletes or rock stars, Catrambone mounted a large world map on his wall to track his father’s travels as well as the location of world events he’d hear about in school or on the news. Catrambone, while sitting in a small southern town, was becoming a world citizen without ever leaving home. After graduating from McNeese State University with a degree in criminal justice studies, he moved to New Orleans and found work as a private investigator for insurance companies looking into the legitimacy of clients’ claims. It was 2005. While Catrambone was investigating a claim in the Bahamas, Hurricane Katrina hit New Orleans. He returned to find his neighborhood under water. “I early on got a deep understanding of what it feels like to be displaced,” he says. From that disaster, Catrambone saw opportunity. He and a few other newly homeless friends pooled their FEMA checks and opened a Cajun restaurant on the tourist-friendly island of St. Thomas. They served gumbo and “high-octane Bloody Marys.” The short-lived venture taught him two things: how to run a company and how tough it is to stay afloat in the restaurant business. He continued as a claims investigator, a job that increasingly took him on trips following private contractors into conflict zones in the Middle East—often close to combat and working with private citizens who had nowhere to go if they got sick or injured. In 2006, Catrambone founded Tangiers Group, which has expanded into a global operation specializing in providing insurance, emergency assistance, on-the-ground claims handling and even intelligence services. As Tangiers grew, Catrambone moved to Italy to be closer to the bulk of his business activity. In 2008, seeking even better logistics in an English-speaking country, Catrambone moved to the Republic of Malta. To him, the arc of his life’s story makes perfect sense. By 2012, Bloomberg estimated that Catrambone and his wife, Regina, were worth about $10 million. But you keep thinking about those you didn’t save. It keeps driving you on to do more. So much so, according to those close to Catrambone, that he and Regina have been willing to siphon off much of their personal savings to underwrite MOAS. Besides the cost of the Phoenix, the Catrambones spent $2.2 million of their own money on operations in 2014. Catrambone’s crusade began as a pleasure cruise. In early July 2012, he and Regina and their daughter, Maria Luisa, set out from an Italian island near Malta for a week-long adventure across the Mediterranean to Tunisia on a 24-foot luxury yacht. As they sailed south, Regina spotted a jacket in the water. One of the family’s guests on the trip explained the jacket likely came from a sunken refugee craft. Refuse, listing craft and floating corpses, he explained, were becoming increasing common sights for those sailing in the region. Prior to their trip, business forced the couple to miss an event they had hoped to attend—a mass led by Pope Francis devoted to the more than 500 migrants who had died earlier that year attempting to flee war-torn Libya for Europe by crossing the Mediterranean in often barely sea-worthy vessels. Pope Francis blasted the wealthy nations of the world for turning a blind eye to the growing crisis. In his youth, Catrambone had been a devoted altar boy who had considered becoming a priest. Now he was sailing in luxury through waters teeming with suffering at a time the pope was chastising the wealthy for ignoring those in need. It was a perfect storm for a moral epiphany. The plight of the migrants became the overriding topic of conversation for the rest of the trip. Catrambone, the driven business innovator, became obsessed with finding solutions. In early 2014, Catrambone began assembling an experienced search-and-rescue crew capable of pulling off the complicated rescue operations. In Portsmouth, Virginia, they found what looked like a good deal on the size of ship they would need. But the 130-foot fishing trawler, besides being infested with rats, would need a major overhaul. Catrambone and a small crew set sail from Virginia in June of that year, and, after a rough crossing of the Atlantic, reached Malta, where the ship was restored and repurposed. The total cost to resurrect the aptly named Phoenix: $5.2 million. After adding two speedboats and two helicopter drones, the MOAS crew set sail in late August of that year. They spent 10 weeks patrolling the waters of the central Mediterranean, finally heading home as the waters turned cold and the height of the migration season ended. Catrambone and his crew had found themselves amid a humanitarian crisis unlike any the region had seen before. From March to October of 2014, 100,000 people departed from the shores of Libya on overcrowded vessels or homemade boats attempting to reach southern Europe—nearly half of the 207,000 people the United Nations estimated attempted to cross the Mediterranean fleeing conflict in the Middle East and Africa. That nearly tripled the previous high in 2011, when nearly 70,000 people fled seeking asylum after the so-called Arab Spring. More than 3,400 people died in the Mediterranean during 2014. But the Catrambones couldn’t afford to finance another year with expanded efforts from their own pockets. Besides the millions spent to get MOAS operational, the complex rescue operations cost an average of $400,000 a month. Through that winter, the MOAS team ramped up fundraising efforts. But money came in slowly. Metsola says she believes that MOAS was slow to attract funding because of misperceptions about its work. She heard grumblings within the European Parliament and among her constituents in Malta. Those rescued at sea, Metsola points out, go through the same intensive immigration process as any refugee once they are transported to a European port. “They are simply keeping people from dying,” she says. “The concern in Europe over this flood of refugees blinded some to the incredible humanitarian crisis at sea,” she says. The governments in the region have done shamefully little as far as rescue operations. MOAS has worked tirelessly to fill that gap. But MOAS’s efforts to raise money gained steam through 2015. Catrambone and his team greatly expanded their online presence. Several major media outlets ran stories on their efforts. Philanthropy groups such as U.S.-based Global Impact began collaborating with them. Doctors Without Borders joined their effort, placing a team of six medical professionals on the Phoenix from May to September last year. As that operation was ending, during which 9,000 refugees were given assistance, the photo of a boy dead on a Turkish beach shocked the international community. As the image of Alan rocked the Western world, the death of countless Rohingya children in the waters off Myanmar continued to go mostly unnoticed outside Southeast Asia. The United Nations considers the Muslim Rohingya in Myanmar to be one of the most persecuted minorities in the world. Attacks by the majority Buddhists and military government intensified in the spring of 2015, leading to another massive exodus. In May 2015 alone, fishing crews rescued more than 1,000 people along the coastlines of the Andaman Sea in the southeastern Bay of Bengal. Tens of thousands more attempted to flee by boat, most often paying smugglers who overload their aging craft to increase profits. Nearly 100,000 Rohingya and Bangladeshis fled their homelands on smugglers’ boats in 2014 and 2015. More than 1,100 people are estimated to have died off the coast of Myanmar since 2014, according to the United Nations High Commission for Refugees. The number of people trying to cross the turbulent waters in 2015 was up about 30% from the previous year. While MOAS was scrambling to keep its intensifying operations in the central Mediterranean afloat, Catrambone took on another massive project: when migrant crossings slowed out of Libya, his team would sail 1,800 miles to Southeast Asia and begin operations off the coast of Myanmar. On Nov. 11, 2015, the Phoenix reached Bangkok after 38 days at sea. After weeks of repairs, the ship and crew began searching the waters for refugees. In Southeast Asia, Catrambone says, the Phoenix might do as much good as a tool to raise awareness as it will as a rescue ship. At the same time the Phoenix was sailing for Bangkok, the MOAS team quickly organized a third operation to assist the mostly Syrian refugees—like Alan’s family—attempting to flee their war-torn country by crossing the Aegean from Turkey to Greece. From Greece, MOAS launched a 160-foot-long, custom-built emergency response vessel, the Topaz Responder, carrying the two high-speed rescue craft named in honor of the brothers who perished in September. They encountered an exodus far larger than the one the previous year. As the MOAS efforts grow, Catrambone is confident the awareness of the human toll of the wars and persecution of minorities will grow worldwide. He hopes that heightened awareness will inspire the world’s governments and citizens to help finance the much larger operations needed to stop deaths at sea. MOAS ended up raising nearly $5 million in 2015, “about enough to cover operations costs from the year,” Gainullin says. Considering its massive expansion, MOAS will likely spend just more than $10 million on operations by the end of 2016. Thankfully, donations from around the world have kept pace with the expanding mission. Private donations as of October had nearly covered this year’s expenses. Tangiers Group is an insurance company that seemingly can provide service to almost anyone anywhere on earth in almost any form of trouble. It provides coverage for everything from aircraft and drones to kidnap and ransom situations. “We had a case where somebody got stabbed in the eye in Afghanistan and needed to be transferred to Dubai for emergency medical treatment,” Catrambone says. Chris is an innovator, a troubleshooter—a guy with incredible energy and passion. Right now, those attributes that have made him so successful are being used to grow this very unique, very effective rescue operation. After a bus crash last year: “We were asked by an insurance partner of ours to find treatment for all the victims, organize evacuations and follow up until everyone was back at work safely,” he says. In what has been described as the largest relocation of humans since World War II, the United Nations estimated more than three million people arrived in Europe fleeing Syria, Iran, Afghanistan and north and east Africa. Increasingly, those making the perilous crossing by boat in 2016 have been women and children. With all they have accomplished, though, Catrambone still feels that he, Regina and his growing team of support staff are far from doing all they should be doing for the world’s refugees. 05High Risk, Big Values, but Big Bust?